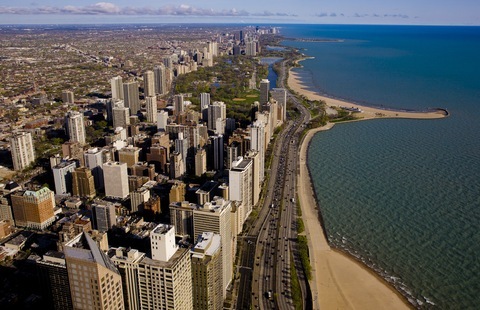 Highrise condominiums line Chicago’s Lake Shore Drive. Chicago, along with Atlanta, Las Vegas, New York and Portland, saw average home prices hit new lows according to the May S&P/Case-Shiller Home Price Indices report. Photo by George Rose/Getty Images. To view a particular city, click Hide All and then select the city’s label. Click and drag your mouse on the chart to zoom in on a particular span of time. Use the box at top to choose your view: quarterly percent change, yearly percent change, monthly index value. â€¢ Phoenix posted the largest annual rate of change (+6.1 percent) while home prices in Atlanta fell the most over the year, down 17.7 percent. Moreover — and this is something most people don’t focus on — the Case/Shiller prices are in nominal, not “real,” dollars. That is, they’re not adjusted for inflation. Thus, when the Index reports that prices are down 2.6 percent from last year in nominal dollars, when you add in the 2.6 percent inflation we’ve experienced, they’re really down 5.2 percent. What to make of prices long-term? As Bob Shiller put it in a morning press conference call, after soaring from 2000 to 2005 and crashing through 2007, housing prices are back in line with their 100-year trend. So are expectations of future price appreciation, it seems. Prices not adjusted for inflation. On the bright side, at least the rate of price decline has slowed. And Bob Shiller noted that one indicator of future growth is positive: housing permits are up, after being in “a holding pattern” for years. Chip Case added that housing starts are up even more, but reminded listeners that they’re up from the lowest level ever recorded and still near their 60-year low. New insights, for me, concerned household formation, the “bifurcated” housing market, and the prospect for higher mortgage rates. Household formation, said Shiller, tracks prices: In other words, the more households created, the higher overall prices are, presumably because of increased demand. But household formation has not been keeping pace, due to more pooled living arrangements. And new households are mainly renting, not buying. In fact, net home ownership is down in the past year, if I understood Chip Case correctly. As to bifurcation, Case pointed out that there are really two housing markets these days: zip codes with people who have financial “flexibility” and places were most sales are “distressed” — “two markets existing side-by-side,” as Chip put it, but with completely different buyers and sellers. On the subject of interest rates, Case pointed out that the federal government now holds or guarantees $4-5 trillion worth of mortgages. As they get taken over by the private market, a new interest rate will reflect the actual risk of default, in which case “interest rates would rise by 300 basis points,” said Case: a full 3 percent. And just imagine, added Bob Shiller, how that figures to discourage would-be home buyers who no longer expect prices to rise. But remember, this is the famously anxious Bob Shiller, whose possibly congenital caution we captured on the Go-Kart track (among other venues) a decade ago.